Michele Curatolo, M.D., Ph.D., Steen Petersen-Felix, M.D., Ph.D., Lars Arendt-Nielsen, Prof., Carmela Giani, M.D., Alex M. Zbinden, M.D., Prof., and Bogdan P. Radanov, M.D., Prof. The mechanisms underlying whiplash pain are unclear. The limited understanding of the mechanisms involved in whiplash pain is an important factor preventing the development of effective therapeutic strategies. In animal preparations, injuries may cause sensitization of spinal cord neurons, which results in increased sensitivity to noxious stimuli and pain after innocuous stimuli (central hypersensitivity). In recent years, central hypersensitivity has been extensively investigated in animals, but there is no strong evidence for its presence in pain conditions in humans. The literature on central hypersensitivity after whiplash injury is sparse. In 2 recent investigations, hyperalgesia has been observed outside the traumatized area; [5, 6] this suggests that central mechanisms may be involved in the hyperalgesia. Because of the strong discrepancy between the availability of animal and human data, there is a need for studies investigating central hypersensitivity in patients. Experimental studies in healthy volunteers suggest that ongoing nociceptive input from the periphery may  or may not  contribute to maintaining central hypersensitivity. In patients with complex regional pain syndrome, local anesthesia of painful foci may abolish allodynia and spontaneous pain. This suggests that ongoing nociceptive input from damaged tissues may maintain central hypersensitivity in complex regional pain syndrome. There is lack of information on the influence of ongoing peripheral nociception on central hypersensitivity in musculoskeletal pain conditions. In humans, hypersensitivity can be demonstrated when sensory stimulation evokes pain at stimulus intensities that do not induce pain in normal subjects. If hypersensitivity is observed after sensory stimulation of healthy tissues, its cause must be in the central nervous system. Moreover, if hypersensitivity is reduced by local anesthesia of the painful foci, this would indicate that an ongoing nociceptive afferent input is important for the maintenance of central hypersensitivity. These hypotheses were tested by analyzing the responses to multimodal sensory stimulation [11, 12] in a group of patients with whiplash pain and in a group of healthy controls, before and after local anesthesia of the painful and tender muscles. The sensory stimulation was applied at both skin and muscle, of both neck (i.e., an injured area) and lower limb (i.e., a healthy area). The sample size was calculated based on the test that we had most frequently used, that is, pain threshold on transcutaneous repeated electrical stimulation. We arbitrarily chose a difference of 2 milliamperes (mA) in the threshold between the groups as the minimum desired difference. Setting α = 0.05 and standard deviation = 1.6 mA (observed previously ), and investigating 14 subjects per group, one can detect a significant difference of 2 mA with a power of β = 0.9 (one-sided hypothesis). We therefore studied 14 patients with chronic neck pain after whiplash injury (car accident) and 14 healthy nonpregnant volunteers. All the subjects were Germanspeaking Swiss. All the patients were equally covered by the country insurance plan as previously described. The patients were recruited at the Department of Psychiatry of the University Hospital of Bern. Based on research experience, the department has established an interdisciplinary service for the assessment and treatment of whiplash patients. All consecutive patients who were evaluated for the first time in the department and fulfilled the inclusion criteria mentioned further on were enrolled. The control subjects were recruited by advertisement. Of the 22 eligible subjects, 14 were chosen to obtain a group with age and gender distribution as close as possible to that of the whiplash group. Whiplash injury was defined as a musculoligamental strain or sprain of the cervical spine due to hyperextension and/or hyperflexion, without head-contact injury, loss of consciousness, post-traumatic amnesia, fractures or dislocations of the cervical spine. Exclusion criteria were the presence of neck pain before the injury, a duration of neck pain less than 6 months, pregnancy, any peripheral or central neurologic dysfunction, and coronary artery disease. The study was approved by the local ethics committee. All the subjects gave written informed consent and received 280 Swiss francs for participating in the investigation. The patients were informed and agreed that the investigation was performed for research purposes only, and that the results would not affect diagnosis, treatment, or legal issues, concerning their pain condition. The German versions of the NEO-FFI test (Neuroticism, Extraversion, Openness-Five Factor Inventory)  and of the SCL-90-R (Symptom Check List)  were used. Both tests are self-report questionnaires. 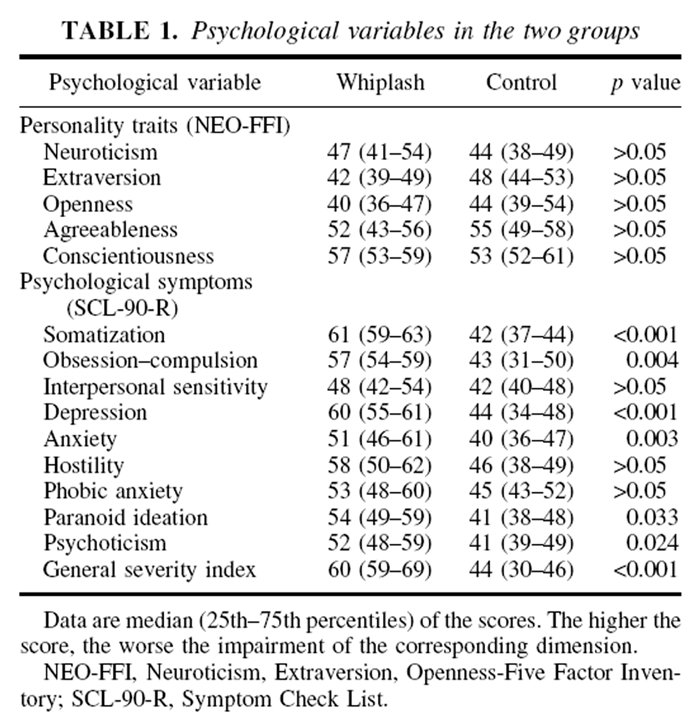 The NEO-FFI assesses 5 personality dimensions (Table 1), which are considered the major dimensions of the human personality. This inventory is reliable when retesting over time, and is therefore independent of current life circumstances. It consists of 60 items (12 for each personality dimension). The item analysis yields a score for each personality dimension. The SCL-90-R is used to assess psychological distress in patients, including patients with chronic pain. [18–20] The SCL-90-R is a multidimensional checklist with 90 items, each describing a physical or psychological symptom. The item analysis yields scores for 9 dimensions (Table 1). In addition, a score for the general psychological distress (general severity index) is calculated. The normal range of the scores of both NEO-FFI and SCL-90-L is 40 to 60. A score greater than 60 indicates an abnormality of the corresponding psychological dimension. The subjects were asked to quantify the intensity of the neck pain at rest on a 10–cm visual analog scale (VAS), where 0 indicates no pain and 10 the worst pain imaginable. Then the subjects were asked to move the head to maximal flexion, extension, and rotation to the right and to the left. The VAS during the movement evoking the strongest pain was recorded. The basic procedure was a gradual increase in the stimulus intensity until the intensity at which the perception turned to a painful sensation (pain detection threshold) or the intensity at which the pain was perceived as intolerable (pain tolerance threshold) was identified. All the assessments were made before and after local anesthesia of the painful and tender points (see Local Anesthesia section). 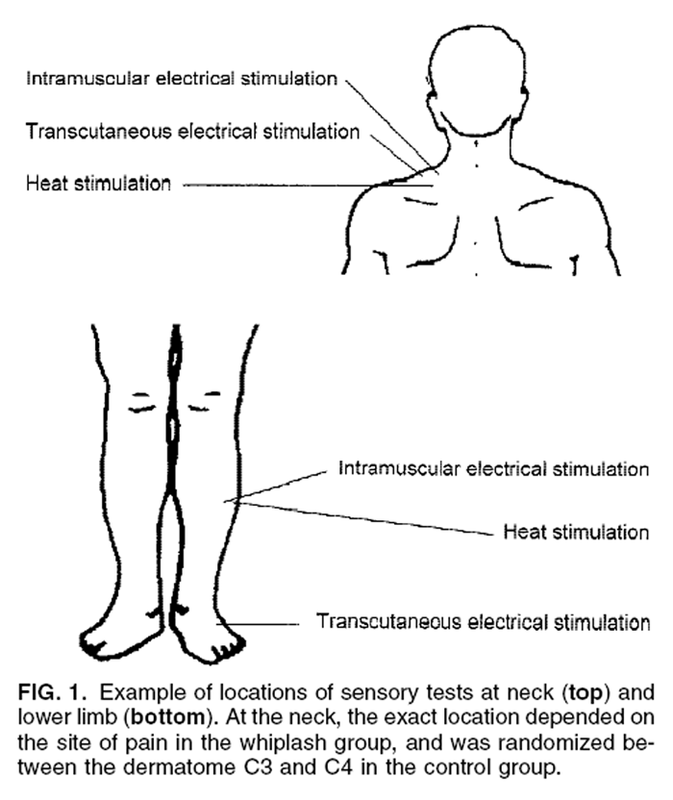 The locations of the sensory tests is illustrated in Figure 1. Each test was performed at a cervical and a lumbosacral dermatome of the same side, in a randomized order. In the control group, the cervical dermatome (C3 or C4) and the side of cervical and lumbosacral stimulation (right or left) were randomly selected. In patients, the tests were applied at the most painful cervical dermatome, at least 4 cm from the sites selected for local anesthesia. 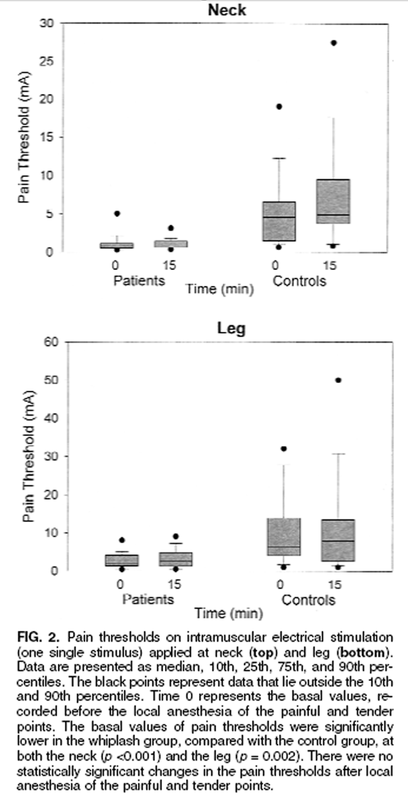 For lumbosacral stimulation of both groups, intramuscular electrical stimulation was applied in the tibialis anterior muscle, 14 cm distal to the middle of the patella, 2 cm lateral to the lateral edge of the tibia. 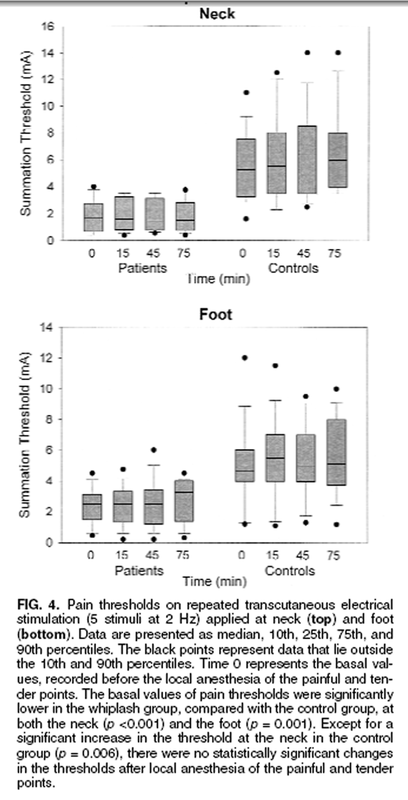 Transcutaneous electrical stimulation was performed at the foot, 1 cm distal to the lateral malleolus. Heat stimulation was applied 2 cm lateral to the intramuscular electrodes. For each measurement, 3 threshold determinations were made. The first one was used to get the subject familiar with the measurement. The mean of the last 2 determinations was used for the data analysis. Two needle electrodes (Dantec, Skovlunde, Denmark) with 3–mm-long uninsulated tips were inserted 2.0 cm from the skin surface into the muscle. The interelectrode distance was 0.5 cm. A train of 5 square-wave impulses (perceived as a single stimulus, each impulse 1 ms, total duration 25 ms) was delivered from a computercontrolled constant-current stimulator (University of Aalborg, Denmark). Based on empirical data of our group, the 5 impulses (perceived as a single stimulus) cause a better activation of thin fibers than a single pulse. The current intensity was increased in steps of 0.1 mA (from 0.2 to 2.0 mA), in steps of 0.5 mA (from 2.0 to 5.0 mA), and in steps of 1.0 mA (from 5.0 mA). After each stimulus, the subject was asked if she or he perceived the stimulus as painful. The stimulus intensity evoking a distinct pain sensation (pain detection threshold) was recorded. Repeated stimuli of constant intensity may evoke an increase in the intensity of perception during the repeated stimulation, so that the last stimuli are perceived as painful. This phenomenon is called temporal summation of nociceptive stimulation. Recordings of spinal reflex in humans indicate that temporal summation results from a short-lasting hyperexcitability of the spinal cord induced by the repeated stimulation. [13, 23] To elicit temporal summation, the stimulus burst so described, delivered through the same electrodes, was repeated 5 times with a frequency of 2 Hz. The current intensity was increased as described (see “Pain detection on intramuscular electrical stimulation”), until the summation threshold was identified. Summation threshold was defined as the current intensity evoking an increase in perception during the 5 stimulations, so that the last 1–to–3 stimuli were perceived as painful. Two bipolar surface Ag/AgCl-electrodes (Dantec, Skovlunde, Denmark) were placed on the skin, 5 mm apart. Repeated electrical stimulation was performed as described for intramuscular stimulation to determine the temporal summation threshold. Subjects of the whiplash group were examined for the presence of painful and tender points at the neck. Painful points were defined as areas of spontaneous pain. Tender points were defined as areas where pain could be evoked by palpation or movement that would not normally be painful. Each point was infiltrated with an intramuscular injection of 1 ml lidocaine 1%. [25, 26] For the control group, one lidocaine infiltration (1 ml) was performed at the same cervical dermatome where the sensory tests were applied. First, the psychological tests were performed and the intensity of neck pain was measured. The subjects then tried all the sensory tests for training. When they were familiar with them, basal measurements of all the sensory tests were performed. The sensory tests and the measurements of neck pain were repeated 15, 45, and 75 minutes after local anesthesia. At 45 and 75 minutes, the single-stimulus intramuscular electrical stimulation was omitted to avoid an excessively long testing procedure. Because of the relatively small sample size and the non-normal distribution of several data, nonparametric tests were used. The two groups were compared for age, weight, height, body mass index (weight in kilograms divided by the square of the height in meters) and psychological variables using the Mann-Whitney rank sum test. The effect of the local anesthesia on the intensity of neck pain in the whiplash group was analyzed by the Friedman repeated measures analysis of variance on ranks. The first hypothesis (see the introduction) was tested by comparing the two groups for the pain thresholds measured before the local anesthesia. The one-tailed Mann-Whitney rank sum test with the Bonferroni correction was used for each sensory test. The second hypothesis was tested by analyzing the time course of each pain threshold (i.e., before and after local anesthesia) using the Friedman repeated measures analysis of variance on ranks. The analyses were performed separately for each group. The statistical software used was the SPSS (Chicago, IL, U.S.A.), version 9.0. A p value less than 0.05 was considered as significant. In the whiplash group, neck pain began within 24 hours after the accident in all patients. The median (25th–75th percentiles) duration of pain was 40 (16–71) months. The median (25th–75th percentiles) intensity of neck pain before the infiltration at rest and during movement was 3.2 (2.3–4.4) and 6.4 (4.9–7.1) cm, respectively. In the whiplash and the control group, the median (25th–75th percentiles) of age was 48 (35–54) and 41 (35–43) years, respectively, the weight 74 (55–85) and 64 (58–71) kg, the height 166 (164–175) and 172 (169–177) cm, and the body mass index 25 (21–27) and 22 (20–23) kg/m2. The number of females/males was 8/6 and 7/7, respectively. For all these variables, the p value was >0.05. Data pertaining to the psychological variables are presented in Table 1. The patients exhibited no abnormal personality traits. On the SCL-90-R, however, they exhibited profiles of distress, with major elevations in somatization, depression, and general severity index, and lesser elevations in obsession–compulsion, anxiety, hostility, and paranoid ideation. The basal pain thresholds were significantly lower in the whiplash group than in the control group for all tests, except heat (Figures 2–5). This difference was observed at both neck and lower limb. Concerning pain tolerance on heat stimulation at the neck, 2 patients in the whiplash group and 2 patients in the control group had thresholds higher than the maximum allowed value of 52°C; at the leg, this value was reached in 7 and 5 patients in the whiplash and the control group, respectively. In the whiplash group, 1–to–4 painful and tender points (median 3) were identified and infiltrated with the local anesthetic. 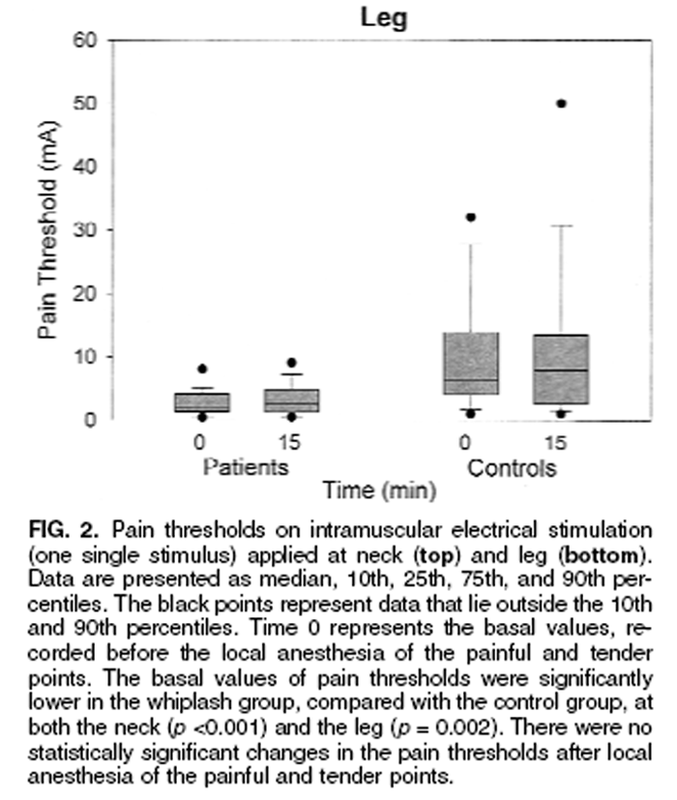 In this group, there was no statistically significant change in any pain threshold after local anesthesia (Figs. 2–5). No significant changes in the intensity of neck pain after the infiltration were observed (Figure 6). The present study focused on the central mechanisms involved in chronic pain after whiplash injury. We found that the stimulus intensity that has to be applied to evoke pain is lower in patients than in healthy subjects (Figs. 2–4). This indicates a state of hypersensitivity of the nociceptive system to peripheral stimulation. The hypersensitivity was observed with both cutaneous and muscular stimulation, applied at both the neck (i.e., the injured area) and the lower limb (i.e., a healthy area). This indicates that an alteration in the processing of sensory stimuli in the central nervous system is involved in the generation of hypersensitivity. Because the local anesthesia of the painful and tender points did not affect the pain thresholds, the central hypersensitivity was not maintained by a nociceptive input arising from these areas. The fact that hypersensitivity was observed at both neck and leg to the same extent indicates a state of generalized central nervous system hypersensitivity, which is consistent with previous investigations. [5, 6] This finding suggests that central hypersensitivity alone can not explain the pain syndrome, because pain is not generalized, but regional. Rather, the role of central hypersensitivity is more likely an amplification of a nociceptive input arising from a focus in the neck. The absence of objective signs of tissue damage is common in patients with neck pain after whiplash injury. Conversely, lesions in the zygapophysial joints associated with pain are frequently not detected by medical imaging or physical examination. Central hypersensitivity could explain exaggerated pain after minimal nociceptive input arising from minimally damaged tissues in the neck. Patients with fibromyalgia display generalized hyperalgesia that is detectable also in nonpainful tissues. This finding is similar to the generalized hyperexcitability that we found in whiplash patients. Patients with fibromyalgia have increased levels of substance P  and excitatory amino acids  in the cerebrospinal fluid, which may be involved in the induction of generalized hyperexcitability of the central nervous system. It is not known whether these biochemical changes are present in whiplash patients. This is the first study in which the effect of nociceptive input on central hypersensitivity in whiplash patients has been investigated. After local anesthesia of the painful and tender points, no significant changes in the intensity of neck pain were observed (Fig. 6). Therefore, the main source of the pain complaints was not located at these points. None of the pain thresholds was affected by local anesthesia (Figs. 2–5). Therefore, the hypersensitivity was not maintained by nociception arising from the painful and tender points. It is possible that central hypersensitivity was maintained by pathologic processes located in other structures of the neck. In this case, the painful and tender points may have been areas of referred pain (i.e., pain reported in areas that are at distance from the diseased tissue). Painful muscular stimulation in the rat induces the appearance of new receptive fields in nociceptive dorsal horn neurons, so that these neurons receive input from deep tissues that are at distance from the site of painful stimulation. This suggests that central mechanisms may lead to a mislocation of the source of pain. Local anesthesia of the referred pain area reduces the intensity of referred pain by 40% after experimentally induced muscle pain. Based on these data, it can be hypothesized that in whiplash patients a nociceptive focus located in deep tissues of the neck maintains the state of central hypersensitivity, and the painful and tender points are areas of referred pain. 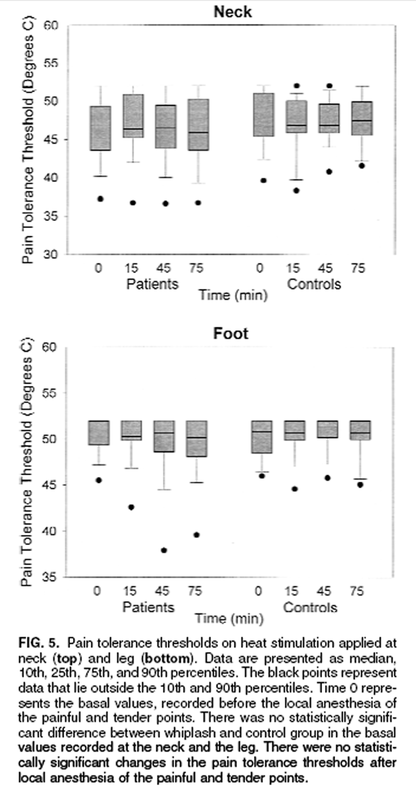 This would explain why local anesthesia of these areas produced a minimal decrease in the pain intensity (Fig. 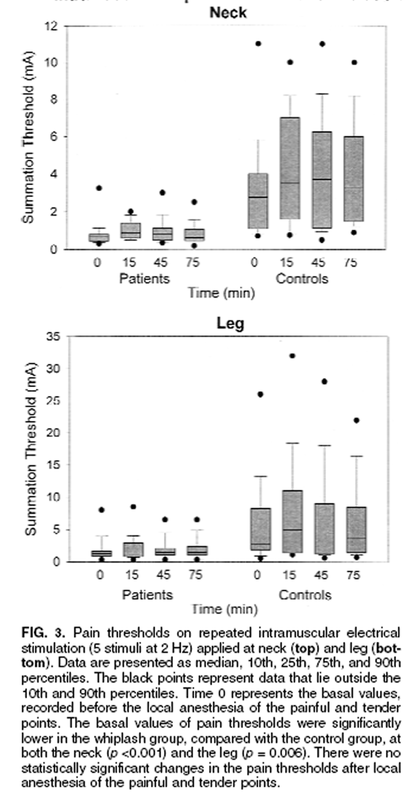 6) and no change in the central responsiveness to peripheral stimulation (Figs. 2–5). In a subgroup of whiplash patients, pain arises from the zygapophysial joints. In these patients, local anesthetic block of the nerves that supply the joints abolishes pain. Future research may investigate the effect of nociceptive input on central hypersensitivity in patients with zygapophysial joint pain by means of selective nerve blocks. Central hypersensitivity may not necessarily require an ongoing nociceptive input. Injury produced by intradermal injection of capsaicin9 induces hyperalgesia in surrounding tissues that is prevented by anesthetizing the skin before the injury. However, hyperalgesia is not prevented when the skin is anesthetized after the injury. This indicates that an initial peripheral event is required to induce central hypersensitivity. Once established, central hypersensitivity may be independent of the peripheral input. Local anesthesia after induction of burn injury reduces but not abolishes hyperalgesia. This indicates that peripheral nociceptive input contributes to, but may not be the only determinant of, central hypersensitivity, at least in experimentally-induced hypersensitivity. If these observations apply to patients, it can be hypothesized that central hypersensitivity in whiplash patients may persist after resolution of the initial tissue damage. However, as mentioned previously, a generalized central hypersensitivity in the absence of a minimal nociceptive input arising from the neck is unlikely to explain chronic neck pain in whiplash patients. This investigation provides evidence for neurobiologic changes that are not associated with alterations in the personality traits (Table 1). This information is new, because the previously published studies on central hypersensitivity in whiplash did not analyze psychological factors. [5, 6] Simulated low thresholds by patients are very unlikely based on the following considerations: patients were informed before the study and agreed that they would not receive any advantage from the results; and the threshold to heat stimulation was not different in the two groups, which indicates that there was no attitude for simulating low pain thresholds. Consistent with previous research,20 we found psychological distress in whiplash patients (Table 1). The psychological profile of whiplash patients as assessed by the SCL-90-R is similar to the profile of patients with chronic pain resulting from other musculoskeletal injuries. Psychological distress possibly contributed to the increased pain sensitivity. However, if psychological factors were the primary determinant of altered pain perception, they would probably affect all the pain thresholds. Again, no difference in the heat pain threshold between patients and controls was found, which is consistent with previous studies on experimental hyperalgesia (see Central Hypersensitivity section). Heat pain threshold is reduced by experimentally-induced anxiety in humans. This finding does not support the possibility that psychological distress may have spared heat pain selectively in our study. Multiple pathways that connect forebrain sites involved in analgesic mechanisms related to emotional states with the dorsal horn have been identified. Descending facilitatory and inhibitory pathways may affect the development of spinal cord hyperexcitability after inflammation and tissue damage in the animal. It can be hypothesized that psychological distress causes a “disregulation” in the descending modulation of spinal cord excitability in whiplash patients, which results in enhancement of the injury-induced central hypersensitivity. Finally, it is also possible that chronic pain results both in central hypersensitivity and psychological distress, which are not causally related, but have a common cause. There is no reliable sensory examination by which adequate anesthesia of muscles can be ascertained. Failure to provide pain relief after local anesthesia may have been the result of either absence of a nociceptive focus in the muscle (as previously mentioned) or failure to anesthetize a nociceptive focus located in the muscle. In both cases, examination of the painful and tender points after the infiltration would not help finding the cause of failure, since it would lead to the same result, that is, persistence of tenderness. Although the infiltration was performed by an experienced pain specialist, we cannot rule out that in some patients a nociceptive focus, if present, was not adequately anesthetized. Lack of statistically significant difference in heat pain thresholds between the groups is an important finding. In some subjects, the heat pain tolerance threshold was higher than the maximum allowed value of 52°C (see Results), which should not be overcome to avoid burn injuries. The number of subjects reaching 52°C was not lower in the whiplash than in the control group, which supports the finding that patients did not display hypersensitivity to heat. As mentioned previously, absence of hypersensitivity to heat is supported by several experimental studies and a recent clinical investigation. However, we cannot rule out that a statistically significant difference in heat thresholds would be found if the test allowed measurements above 52°C and/or a higher number of subjects had been analyzed. Chronic pain after whiplash injury is associated with central hypersensitivity. In our patient population, central hypersensitivity was not affected by local anesthesia of the painful and tender areas. This alteration in the central processing of nociceptive stimuli is not necessarily associated with detectable tissue damage and modifications in the personality traits. (3) imbalance of the descending modulatory system. The relative contribution of these mechanisms is unknown. Central hypersensitivity should be considered as a possible mechanism underlying whiplash pain, even when no organic lesions are identified by the common diagnostic methods. The development of therapeutic procedures aiming at preventing or treating central hypersensitivity is an important field of future research. The authors thank Prof. Anthony H. Dickenson (Department of Pharmacology, University College, London, UK) for reviewing the paper; and Dr. Pietro Ballinari, statistician at the Department of Psychology of the University of Bern (Switzerland), for performing the statistical analyses. Spitzer WO, Skovron ML, Salmi LR. Long-term outcome after whiplash injury. A 2-year follow- up considering features of injury mechanism and somatic, radiologic, and psychosocial findings. Peripheral and central hyperexcitability: differential signs and symptoms in persistent pain. Sheather Reid RB, Cohen ML. Psychophysical evidence for a neuropathic component of chronic neck pain. Koelbaek Johansen M, Graven-Nielsen T, Schou Olesen A, et al. Generalized muscular hyperalgesia in chronic whiplash syndrome. Torebjörk HE, Lundberg LE, LaMotte RH. Central changes in processing of mechanoreceptive input in capsaicin-induced secondary hyperalgesia in humans. J Physiol (London) 1992;448: 765–80. Dahl JB, Brennum J, Arendt-Nielsen L, et al. The effect of preversus postinjury infiltration with lidocaine on thermal and mechanical hyperalgesia after heat injury to the skin. LaMotte RH, Shain CN, Simone DA, et al. Gracely RH, Lynch SA, Bennett GJ. Painful neuropathy: altered central processing maintained dynamically by peripheral input. Curatolo M, Petersen-Felix S, Arendt-Nielsen L.
Sensory assessment of regional analgesia in humans. A review of methods and applications. Induction and assessment of experimental pain from human skin, muscle and viscera. In: Jensen TS, Turner JA, Wiesenfeld-Hallin Z, eds. Proceedings of the 8th World Congress on Pain. Arendt-Nielsen L, Brennum J, Sindrup S, et al. Electrophysiological and psychophysical quantification of central temporal summation of the human nociceptive system. Eur J Appl Physiol 1994; 68:266–73. Adding sodium bicarbonate to lidocaine enhances the depth of epidural blockade. NEO-Fünf-Faktoren Inventar (NEOFFI) nach Costa und McCrae. Die Symptom-Checkliste von Derogatis. Deutsche Version. Costa PT, Jr., McCrae RR, Zonderman AB, et al. Cross-sectional studies of personality in a national sample: 2. Stability in neuroticism, extraversion, and openness. Bernstein IH, Jaremko ME, Hinkley BS. On the utility of the SCL-90-R with low-back pain patients. Duckro PN, Margolis RB, Tait RC. Psychological assessment in chronic pain. Wallis BJ, Lord SM, Bogduk N.
Resolution of psychological distress of whiplash patients following treatment by radiofrequency neurotomy: a randomized, double-blind, placebo-controlled trial. Laursen RJ, Graven-Nielsen T, Jensen TS, et al. Quantification of local and referred pain in humans induced by intramuscular electrical stimulation. Arendt-Nielsen L, Nielsen J, Petersen-Felix S, et al. Effect of racemic mixture and the (S+)-isomer of ketamine on temporal and spatial summation of pain. Characteristics of second pain and flexion reflexes indicative of prolonged central summation. Brennum J, Arendt-Nielsen L, Horn A, et al. Quantitative sensory examination during epidural anesthesia and analgesia in man: effects of morphine. Difference in pain relief after trigger point injections in myofascial pain patients with and without fibromyalgia. 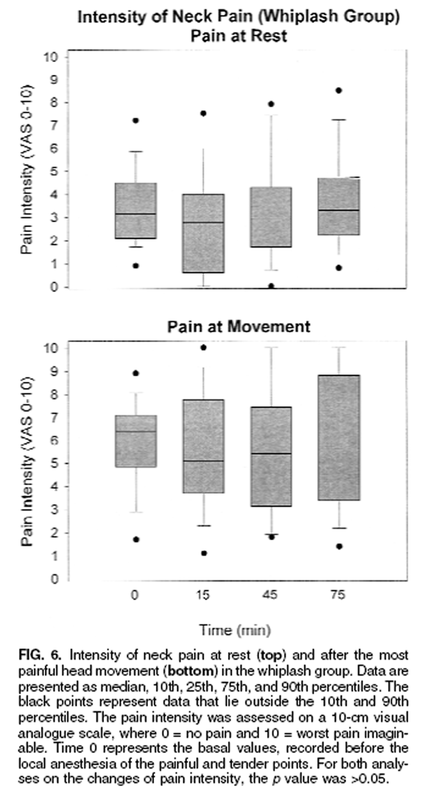 Arch Phys Med Rehabil 1996;77:1161–6. Hameroff SR, Crago BR, Blitt CD, et al. Comparison of bupivacaine, etidocaine, and saline for trigger-point therapy. Long term alterations in the excitability of the flexion reflex produced by peripheral tissue injury in the chronic decerebrate rat. Receptive fields of rat lamina 1 projection cells move to incorporate a nearby region of injury. Guilbaud G, Kayser V, Benoist JM, et al. Modifications in the responsiveness of rat ventrobasal thalamic neurons at different stages of carrageenin-produced inflammation. Baillieres Best Pract Res Clin Rheumatol 1999;13:261–85. Sörensen J, Graven Nielsen T, Henriksson KG, et al. Russell IJ, Orr MD, Littman B, et al. Larson AA, Giovengo SL, Russell IJ, et al. Raja SN, Campbell JN, Meyer RA. Campbell JN, Khan AA, Meyer RA, et al. Responses to heat of C-fiber nociceptors in monkey are altered by injury in the receptive field but not by adjacent injury. Svensson P, List T, Hector G.
Analysis of stimulus-evoked pain in patients with myofascial temporomandibular pain disorders. Hoheisel U, Mense S, Simons DG, et al. Appearance of new receptive fields in rat dorsal horn neurons following noxious stimulation of skeletal muscle: a model for referral of muscle pain? The effect of compression and regional anesthetic block on referred pain intensity in humans. Lord SM, Barnsley L, Wallis BJ, et al. Chronic cervical zygapophysial joint pain after whiplash. A placebo-controlled prevalence study. Peebles JE, McWilliams LA, MacLennan a R.
A comparison of symptom checklist 90-revised profiles from patients with chronic pain from whiplash and patients with other musculoskeletal injuries. Fear and anxiety: divergent effects on human pain thresholds. Endogenous mechanisms of sensory modulation.